With the DENR-USAID Philippines Biodiversity and Watersheds Improved for Stronger Economy and Ecosystem Resilience (B+WISER) Program and the ASEAN Centre for Biodiversity (ACB), EEPSEA sponsored the International Conference on Conservation Financing in Southeast Asia on 3-4 March 2015 in Manila, Philippines. The conference brought more than 90 participants together to share recent knowledge and discuss lessons learned from successful conservation finance schemes in the region. It focused on mechanisms that are scalable and repeatable to other conservation areas. 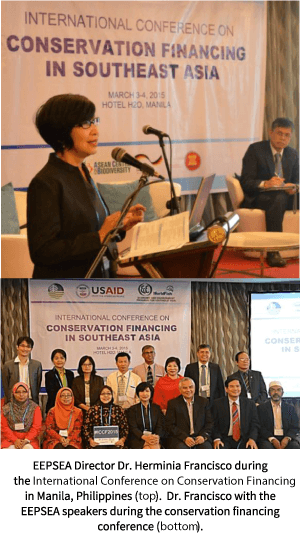 Conservation finance experts, key government officials and environmental policymakers, park managers of conservation areas, and noted resource and environmental economists in Southeast Asia attended the event. The conference was also livestreamed to reach out to others who are engaged in biodiversity conservation and forest management. The conference informed government officials on processes to develop conservation financing programs in support of sustainable management of protected areas in the region. In particular, it provided inputs to the upcoming development of a Road Map for Financing Philippine protected areas to boost environmental resiliency and help the country become more stable and prosperous. Furthermore, among the objectives of the conference was to seek innovative financing schemes that mobilize funding and community action needed to provide the long-term sustainability and improved livelihoods to forest dependent communities in the region. Researchable areas to enhance the role of conservation financing in protected area management were also identified. These included conservation financing for ecosystems services, consumption goods, nature-based recreation, coastal habitats, and marine ecosystems. The EEPSEA cross-country study on the “Fiscal Gap and Financing of Southeast Asia’s Protected Areas” was one of the keynote presentations during the event; the study results were well received by the conference participants. The conference participants are optimistic that the conference will yield partnerships and improve networking. This, in turn, will boost conservation efforts though conservation financing, which will require a lot of effort but potential benefits can last for generations.